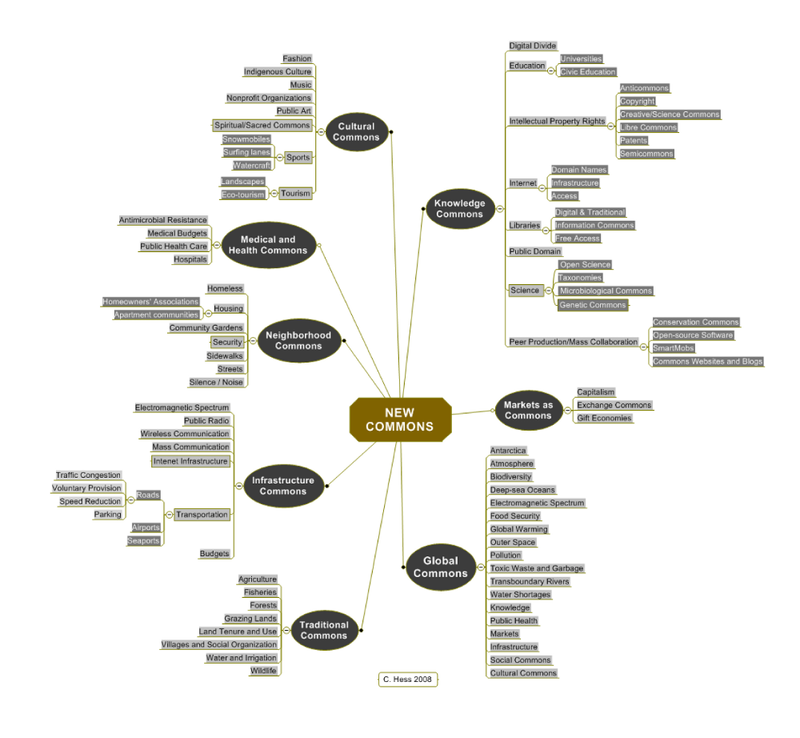 This new section exclusively devoted to the emergence of Commons in various fields. Most commons fall into three general categories – gifts of nature, material creations, and intangible creations (i.e. the Three Commons. . Here are the Four Rules against the False Abundance of the Eternal Growth Economy. In politics: Mapping a Coalition for the Commons. By Philippe Aigrain. 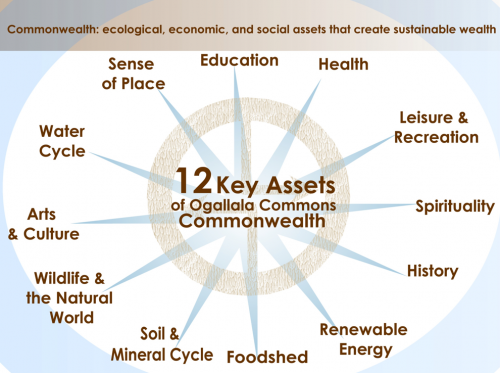 Key Article from James Quilligan: Beyond State Capitalism The Commons Economy in our Lifetimes. "Our global economic system is now in grave crisis, threatening the entire planet, its institutions and species. A new kind of common wealth is needed to protect the assets of Earth, resolve our private and public debts, and create a global society of justice, sharing and sustainability for everyone. Our commons are the collective heritage of humanity — the shared resources of nature and society that we inherit, create and use. People across the world are now rediscovering these common goods and choosing to protect them for future generations. Whether our commons are traditional (rivers, forests, indigenous cultures) or emerging (solar energy, intellectual property, internet), communities are managing them through unique forms of self-governance, collaboration and collective action. And in working together to preserve these resources, we are generating new standards of responsibility, mutual aid and sustenance for all beings. Eight Points of Reference for Commoning. By Silke Helfrich. Is there a difference between the Common and the Public? Introduction to Commons-centered economics. By Sam Rose, Paul Hartzog et al. Darryl Birkenfield: What is the Meaning of Being a Commoner? "There is a spectrum of commonality ranging from the ontological common to the multitude and the global commons. In Dutch only, the root of all these words is the same. It stems from ‘maneg’, meaning many. Commoning is an art of the many." "Municipal goods and services are not “commons,” and rental vehicle from a company-owed fleet is not “collaborative.” Confusing things only can lead to disillusionment and disappointment. Anglo culture and the absence of public policies in the US tended to distort the terms “commons” and collaborative consumption/”sharing.” Municipal bicycle or car-sharing services, even though they may be shared in the sense that there is one vehicle and many users, don’t create any kind of commons, nor are they collaborative consumption. They are mere extensions of transportation services, no different from other public utilities when they are publicly owned, or from a car-rental company when privately owned. The “commons,” that which is communal, is goods that belong to a community, a group of real people, a demos, that manages it jointly and directly. Public property is something else: it is State property. But, isn’t public property, by definition, the common property of all citizens? Wouldn’t municipal public goods be, by definition, “communal?” No. Publicly-owned goods are managed through specific institutions that decide how they are used and where the profits go. Citizens don’t take part directly in management and decisions about these goods and their use. They are not communal. Equity is at the center — Everyone deserves a fair share of social and natural resources that belong to us together. Sustainability is a priority — Our common wealth must be cared for so that it can serve everyone, including future generations. Interdependence is cultivated — Cooperation and connection in our communities, around our world and with our living planet is essential for the future. We Govern Together — Everyone is involved in gathering information, making decisions and exercising power. All Are Responsible — Together we claim the power to repair inequity, restore our common inheritance and expand opportunities for human fulfillment and planetary resilience. Ownership is Expanded — A more expansive view of belonging fosters broader understandings of what ownership means and new structures for how it works. We Create Collaboratively — A spirit of common purpose lets us realize that abundance, not scarcity, prevails when we invite wider participation in our endeavors. And we name and claim the Commons that Exist All Around Us — Right here. Right now. We don’t need to invent or to recreate it. We can see it, name it, claim it, protect it and expand it. Source: Hess, Charlotte, Mapping the New Commons (July 1, 2008). It's about resources (allocation). It's about us. 1. Inherited Commons – e.g. earth, water, forests – are heavily under attack and becoming scarce commons. It doesn't have to be this way i.e. in Switzerland, Austria, Japan they are well managed under an agricultural commons, and have been protected for hundreds of years by good collective arrangements between the farmers. 2. Immaterial Commons – e.g. Cultural, intellectual, enabled by the internet, makes it stronger and easier to do than before. Commoning in this sense can be abstract but when we do it around something we care about, whether its free software, open design or wikipedia this really creates a community of shared interest because its something that we all care about. See also: David Bollier maintains an updated list of Commons-oriented projects. Air to breathe: This page focuses on the need to breathe clean air, and its relationships to other needs. Air and Atmosphere: This page discusses air and atmosphere as a resource, and hence approaches to better management of pollution, and reduction of greenhouse gas emissions. Food: How to make sure everyone has sufficient and nutritious food, appropriate to their cultural preferences and tastes. [http://commonsabundance.net/wiki/local-food-systems/ Local food systems: Local food systems involve a combination of approaches to creating greater abundance of food, while also enhancing food security and providing for meaningful livelihoods. Seed Saving: Seed saving to protect crop genetic diversity and farmer livelihoods, and for gardening. Water to Drink: This page discusses the need for clean water, and approaches to equitable provisioning of water, especially in urban areas. Water: The issues faced in maintaining the quality and quantity of water resources. "Where people work together to both share those resources that are shareable now (software, designs, knowledge, waste that can be used as food, surplus capacities and resources) and cooperate to produce items that are still based in scarcity, then re-invest the profits into creating more and more abundance-economy-based systems." "The main way in which propaganda has been used to try and dull people's thinking about what water is, what food is, what the land is, is by first and foremost redefining everything that we get from the earth as purely raw materials and commodities. It's a denial of the capacity of human beings, of living resources, of equal systems, which is at the heart of the corporate propaganda that enables privatization, that enables takeover and the creation of property in that which should never be private property, that which should always belong to the commons." Even an entire society, a nation, or all simultaneously existing societies taken together, are not the owners of the earth. They are simply its possessors, its beneficiaries, and have to bequeath it in an improved state to succeeding generations as boni patres familias [good heads of the household]. "As Karl Polanyi (1944: 72) argued, labour and land are “fictitious commodities”, for “labour is only another name for a human activity which goes with life itself… nor can that activity be detached from the rest of life…; land is only another name for nature, which is not produced by man”. "If you observe an occupation, you see a community that is producing its politics autonomously, not following hierarchical or authoritarian political movements with a pre-ordained program; you see for-benefit institutions in charge of the provisioning of the occupiers (food, healthcare), and the creation of an ethical economy around it (such as Occupy’s Street Vendor Project). This is prefigurative of a new form of society in which the commons is at the core of value creation; these commons’ are maintained by non-profit institutions, and the livelihoods are guaranteed through an ethical economy. Of course there are historical precedents, but what is new is the extraordinary organisational, mobilization and co-learning potential of their networks. Occupy works as an open API with modules, such as ‘protest camping’, ‘general assemblies’, which can be used as templates and modified by all, without the need for central leadership. We can now have global coordination and mutual alignment of a multitude of small-group dynamics, and this requires a new type of leadership. The realization of historical moment of Peak Hierarchy, the moment in which distributed networks asymmetrically challenge vertical institutions in a way they could not do before, forces social movements to look for new ways of governance… but these are not given, and have to be discovered experimentally, and of course, there will be valuable lessons to learn from predecessor movements!" "Enclosures have appropriately been called a revolution of the rich against the poor. The lords and nobles were upsetting the social order, breaking down ancient law and custom, sometimes by means of violence, often by pressure and intimidation. They were literally robbing the poor of their share in the common, tearing down the house which, by the hitherto unbreakable force of custom, the poor had long regarded as theirs and their heirs." - Karl Polanyi, The Great Transformation, 1944. Film: This Land is Our Land. The Fight to Reclaim the Commons. Written by David Bollier et al. 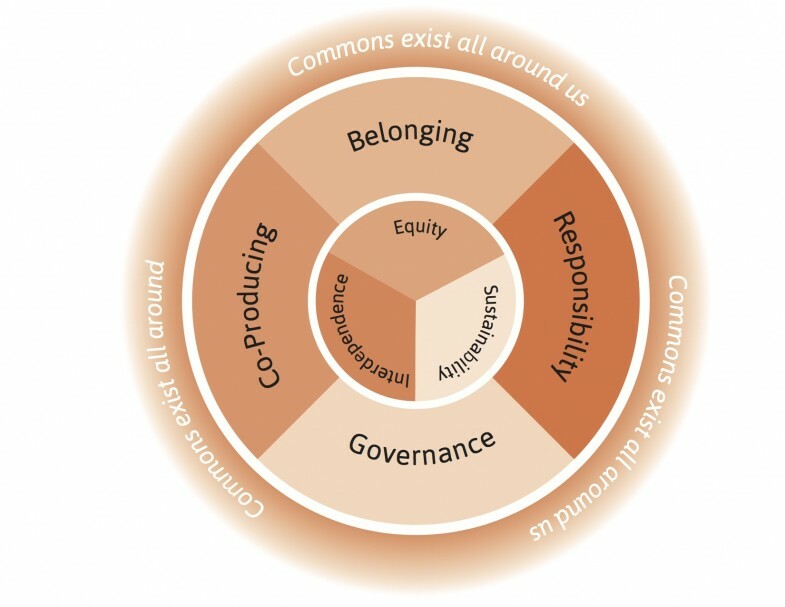 Equity and the Commons, the five principles of equitable sharing, as proposed by On The Commons. 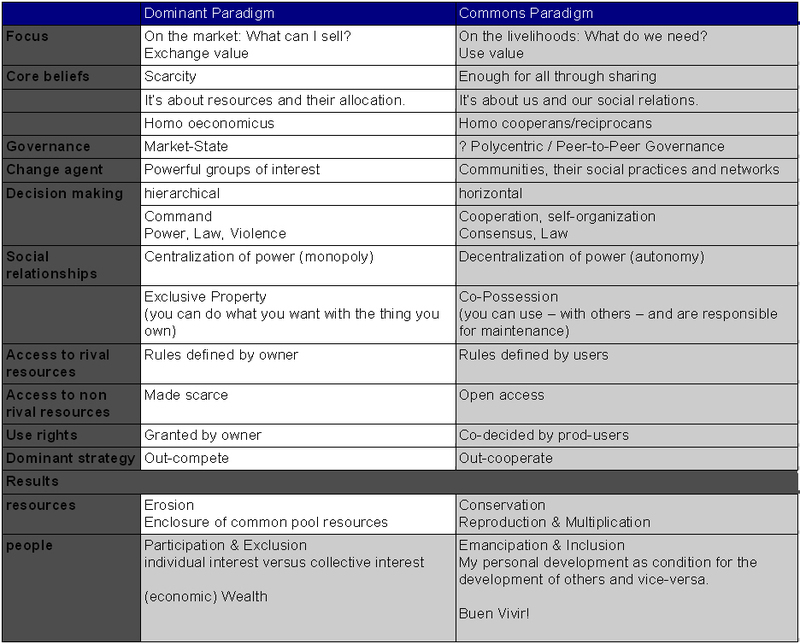 The Commons as a Template for Transformation. By David Bollier. The Commons as New Narrative for Our Times. Silke Helfrich and Jorge Haas. The Triune Peer Governance of the Digital Commons. By Michel Bauwens. The State, the Market, and some Preliminary Question about the Commons. Ugo Mattei. An absolutely crucial text by Ugo Mattei on how the Western legal tradition needs to be fundamentally overturned in order for the common and the commons to emerge as core principle of a new legal-institutional system. Can We Liberate the Market through Commons Governance? By Wouter Tebbens. : "In the Barcelona-based Escola dels Commons we study the commons and right now we are discussing about the market, how current markets work and how they could work, if redefined under commons logic." From Firms to Platforms to Commons. By Esko Kilpi. The Co-Belongingness of Money and Community. By Luigi Doria and Luca Fantacci. The Common Thread. By John Sulston: a nuanced defense of treating knowledge of the genome as a commons. Common Cause. Information Between Commons and Property. Philippe Aigrain. Unpubished, select version of: Cause Commune. Sustaining the Commons. By John M. Anderies and Marco A. Janssen. Center for the Study of Institutional Diversity, 2013.: " a lucid, logically presented introduction to the key concepts of Ostrom’s research"
Four conditions for successful commons. by Mark van Vugt: "I have identified four key conditions for the successful management of shared environmental resources: information, identity, institutions and incentives. I believe we can and should use this 4i framework as the basis for a plan of action to combat local and global environmental catastrophe." Christian Siefkes (2009), The Commons of the Future. Building Blocks for a Commons-based Society. The Five Commons - ( http://forwardfound.org/blog/?q=five-commons ) a “minimally necessary” set of practices to achieve a sustainable society. People Sharing Resources. Toward a New Multilateralism of the Global Commons. James Bernard Quilligan Kosmos Journal, Fall | Winter 2009: this article frames what a global commons-based policy and governance structure should be. World Commons Day, October 15, 2010. The Commons Podcast Series: podcasts accompagnying the syllabus by David Bollier, "The Rise of the Commons,"
Developing the Meta Services for the Eco-Social Economy: on developing a framework for an eco-social economy - includings its arrangements to manage natural commons. Text proposed by Feasta, Ireland. By Brian Davey with the assistance of John Jopling. The following 200 pages are in this category, out of 1,687 total. This page was last modified on 26 August 2017, at 07:27. This page has been accessed 153,649 times.